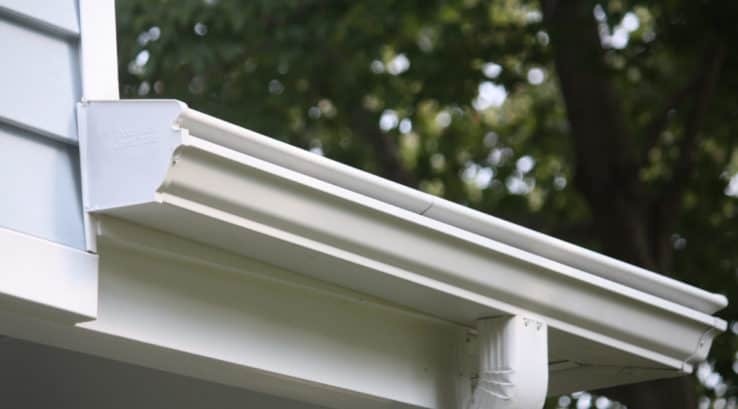 A properly designed, installed, and maintained rain gutter system will protect your home for years to come. But if any part of that optimal gutter equation is lacking, your home will be prone to damage to the exterior, landscaping, and even the interior of your home. Gutter design – A properly designed gutter system should drain water off your roof, down through the downspouts, and away from your home. First, you need to be sure the gutter size is appropriate for the amount of roof surface you have. Typical residential gutters are five or six inches wide, which refers to the depth from front to back. If you have a larger roof surface or less downspouts, going with six inch gutters is ideal. This is especially true for homes in Maryland, Virginia, and Washington DC that are prone to sudden heavy downpours during the spring and summer. Your gutter runs should slope down towards each downspout. The ideal pitch is a ¼” drop for every 10 feet of gutter. Downspouts are usually installed at sizes of 2 x 3 inches or 3 x 4 inches, with the larger size doing a better job at draining water from the gutters. There should be a sufficient number of downspouts installed around your home to properly carry the water away. At the end of each downspout you should have a system to prevent water from pooling at the bottom. A splash block, perforated drainage pipe, or a buried drainage system are all options to carry water away from your home. Gutter installation – All too often, the gutter system size, materials, and installation methods are less than ideal when a new home is built. This is especially true in the case of builder-grade installations. After just a few years, homeowners may start to see signs of gutter failure. Overflowing gutters, leaking behind fascia and soffits, signs of water reaching the foundation and basement, and landscape soil erosion are all problems associated with poorly installed gutters. 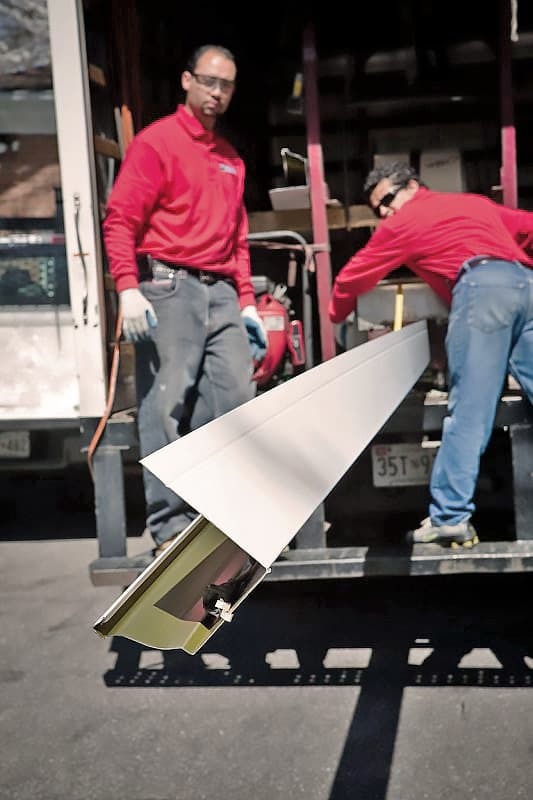 One of the most important features with a good gutter system is the flashing. Flashing refers to the sheet of metal installed between the back of the gutters and the support structure of the roof under the shingles. If there is no flashing installed, the wood framing of your roof will be exposed to rainwater, causing wood rot and inviting insects to take up residence. Another important factor is the method used to attach the gutter runs to the home. Spike and ferrules used to be a common method of installation, although they are not as commonly seen in new or replacement gutter systems. The ferrule is a metal tube placed inside the gutter for strength and the spike is passed through that and nailed into the wood framing. But this method tends to loosen or pull out from the roof framing over time, causing gutters to sag and eventually pull away from the roof line. A more secure installation uses an inside bracket. These hidden brackets are attached to the roof underneath the shingles, which makes them much stronger. As mentioned earlier, gutter pitch is important. If a gutter system was installed without the proper pitch angling down towards the downspouts, water will not drain properly. This creates areas of standing water in the gutters, increasing the chances of developing rust holes, and water backing up which can damage the roof, siding, or foundation. It also creates the perfect breeding ground for mosquitoes. Gutter maintenance – Maintaining your gutter system is important to prolong the life of the gutters and continue to properly route water away from your home. Clogged gutters or downspouts can cause water to back up and leak into your home through the roof or walls, and pooling water can wreak havoc with your foundation. Remove debris from all gutter runs. If it’s dry, it’s easy enough to scoop out the contents. If the debris in your gutter is damp, use a garden trowel to scoop out what remains in the gutters. Check the flow through your downspouts. An easy way is to use a garden hose to run water down through each downspout and check the flow exiting at the bottom. If there is a clog, often a powerful spray from your hose is enough to loosen the clog. If it’s more stubborn, get out your plumbing snake and clear the clog that way. Always be careful when clearing clogs so you don’t damage the gutter or downspouts, taking special care around the hanger points and gutter seams. You should make a habit of checking the area at the bottom of your downspouts during or just after a heavy rain. If you see standing water, your drainage system is inefficient at carrying water away from your home. If necessary, install a larger splash block, or for particularly heavy pooling you can use a perforated plastic pipe (buried or above ground) to carry the water out farther. Otherwise, you risk damage not only to your foundation, but to your landscape plants and soil erosion. Whether you perform gutter cleaning yourself or hire a company to maintain them for you, this is one task that should always be on your to-do list at least twice a year, with more frequent visual inspections for clogs along the gutter runs. Ladder safety is an important issue whenever working on your gutters, so if you have any hesitations it’s best to call in a gutter company.